This fully synthetic, mid-cut boot is built to handle the tough terrain and varied conditions that hunters encounter as a matter of course, all while delivering the comfort that comes from a lighter-weight design. It’s firmly supportive underfoot, which allows for a more precise feel and protection on uneven terrain. Durably waterproof/breathable. 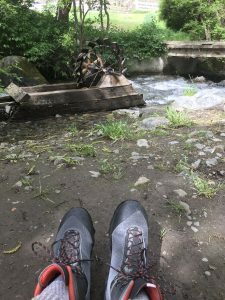 Where do you go when you want to test out a great trekking boot? 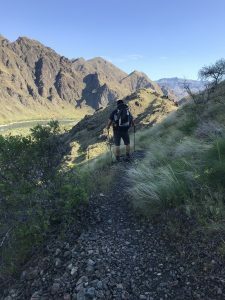 Well, Hells Canyon on the Idaho/Oregon border is a great place to start! This canyon has been intimidating people since before the time of Lewis and Clark. It is steep, deep, and covered with basalt and granite. This is the kind of place that will chew up a boot and leave your feet in very poor shape. It is hot, rough, unforgiving and it is the perfect place to go for a mid-spring hike! I received the Irox GTX boots after seeing them at the 2017 Outdoor Retail Show. 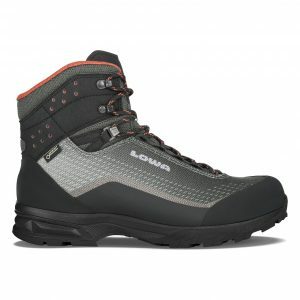 I was very excited to see LOWA offer a high quality lightweight (2.64 LBS) MID height boot and with an outsole that I was unfamiliar with. The Lowa Elika sole is really a pretty neat outsole and it offers some really great traction. It appears to be very durable and the ability to have the boots resoled is a very attractive feature indeed! I really love how well the boots look on paper and was really excited to get them out in the field! 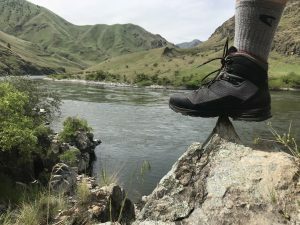 I am no fool when it comes to testing out footwear and though it is not anything close to the grueling trails of Hells Canyon I thought I would wear the boots to work for a few weeks to try and get them broken in.My feet felt great during my “break in” period even though it was pretty mild. As with all my boots I immediately threw away the insoles that come with the boot and replaced them with an aftermarket insole. Again, I would love to see Lowa partner with SOLE or SUPERfeet and start to offer some high quality insoles with their boots. That said the boots were very comfortable though I did notice that the toe box was a bit roomier than I would like. My city walking was over as my Hells Canyon trip was now upon me and it was time to get into the hills. The trail was packed tight as the night before brought with it a hard rain. We tromped along through mud, dirt, sand, creek crossings, and all manner of rock. The first four miles went very smooth and though I did have to stop to tighten my boot once I was very happy with how well they were performing. At the Six mile mark we made it to the historic Kirkwood Ranch and we stopped to have some lunch before continuing on the trail. I took off my boots and let my feet air out for a while. At this point they were pretty happy. The next two miles were not what you would consider grueling but the heat made them somewhat unpleasant. When we rolled into our camping area I had begun to feel a slight hotspot on my inner right heel. I could see a small blister but it was nothing to worry about. 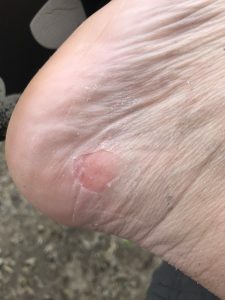 The next day we put on another 6 miles and by the end of the day I had worked up a pretty impressive blister on the inner heel. This was an unusual spot for me to get a blister and so I was honestly very surprised. Luckily I had some liquid bandage and some duct tape to patch it up for the rest of the journey. My trip went over with great success and though I did get a pretty ugly blister I do not really blame the boots. My feet are soft and not yet in hiking shape so I cannot really blame the boots. Time will tell if this is a persistent problem with these boots. The only real concern is that the toe box seems to be quite large and for my narrow foot it does allow more movement than I would like. It is hard for me to say this was an issue as it did not cause any discomfort or pain but was more of a bother than anything else. Ultimately the boots were great. They stood up against the 20 miles of trail I put them through on my weekend trip. I really think this is a very good light weight boot for spring/summer backpacking trips. Man, I’m not sure that I would change anything with these great boots other than the insoles. My feet are a little small for them as far as width goes but that is my issue and nothing negative about the boots. I’m sure that many out there will love that about them. Another 5 star boot from LOWA!